for the past few years i have picked one word to guide my year. i've picked words like fun, balance, and last year focus. some years i have had a lot of success with my word, and others years...well, not so much. with the beginning of a new year, i am excited to think about the year ahead, and what my life needs. this year i'm joining a few friends (love ashley, my new lines, and one hoolie mama) for a monthly linkup. i've been thinking about my word for 2016 for the past few months. my life hit an all time crazy in october, and i talked about not having time for anything important. it really made me think. i have been filling my life so full of good things, but those good things are getting in the way of the best things. this year i want to make more time for the very best things. i want to take more time to be still. i'll be back later in the week to talk more about my goals, and how i plan to take more time to be still. I like your word for this year! Its so important to take time and be still and stay in the now moment. Its hard to do, but if we make an effort to do it each and every day it will change our life! Way to go! I love this as a word. I keep reading other people's choices and I am like, "Darn! That's a good one!" Love this. Great choice! I really like this. A lot of people pick action related words, but sometimes the best idea is just to relax and take it all in. Love, love, love this!!!! Can't wait to see it unfold! This is a great word! I love that. More than you know. 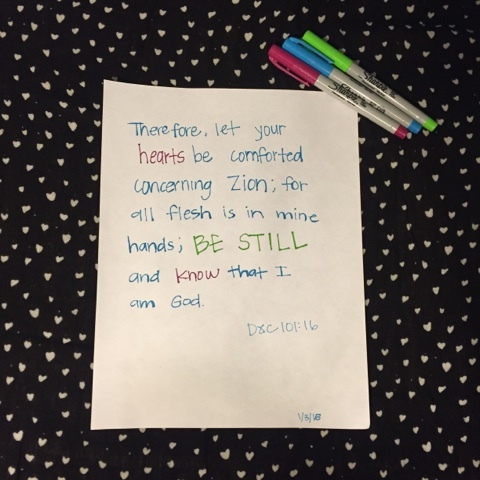 Be still! My word/phrase is let go and it's truly the one message I was being told over and over in my prayers. I can't wait to see you tackle 2016, stillness included. I love the word you chose! I'm excited to see how you'll use it and how it'll shape your year! I love the one word idea! great word :) your blog is adorable! thanks for this linkup! This is great. Just linked up my word and I like how you are holding accountability for us to share how we are doing. A great motivator. Many lose sight of their goals/words/resolutions so this give us not only something to write about but to actually see if our word is sticking. Shared on Facebook. Thanks for the party.